This class implements connection management for signal and slot objects. It makes sure that all connections where this object is involved are closed on destruction. Deriving classes can overload Connectable::opened and Connectable::closed to tune connection managenment. When a Connectable object is destroyed, it closes all its connections automatically. This function is called when a new Connection involving this object is closed. The default implementation removes the connection from its list of connections. Reimplemented in cxxtools::Signal< const cxxtools::Event & >, cxxtools::DelegateBase, and cxxtools::SignalBase. This function is called when a new Connection involving this object is opened. The default implementation adds the connection to a list, so the destructor can close it. 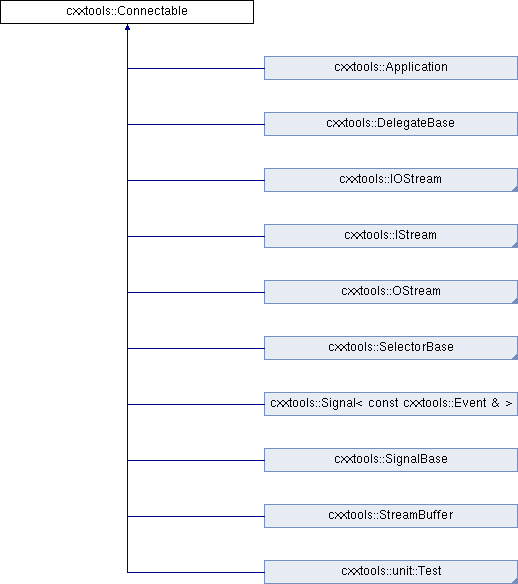 Reimplemented in cxxtools::Signal< const cxxtools::Event & >, cxxtools::SignalBase, and cxxtools::DelegateBase. Connectables can be copy constructed if the derived class provides a public copy constructor. Copying a Connectable will not change its connections.